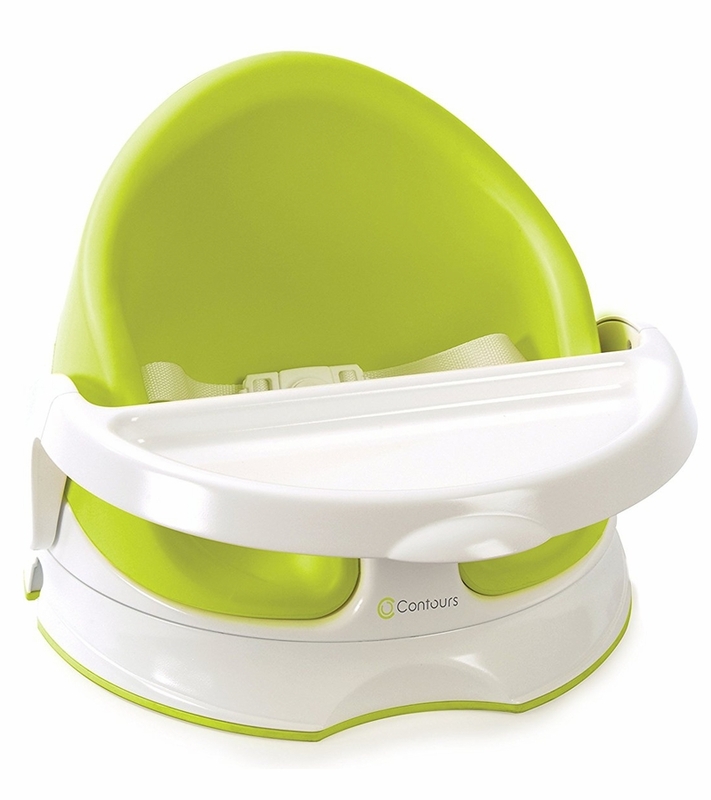 The Contours Twist easily grows with your child from infant floor seat to a big kid booster seat for table � with a twist! The Grow-With-Me Seat rotates 180� to five different positions. You get easy access to your little one from every angle. I love how light and portable the design is and the twist feature is great. It seemed quite comfy initially. Unfortunately I wasn't able to use it because my baby was too big. At 1 year 3 months, my little one was, and continues to be, referred to as a Giant Cub. Though he could sit in the seat, his legs were too large for the little tray to attach. We used it a handful of times without the tray, but ultimately it didn't really work for us. I had my cousin try it out with her 2 year old (who was average size, not a giant) and it worked very well for her. This seat works great! 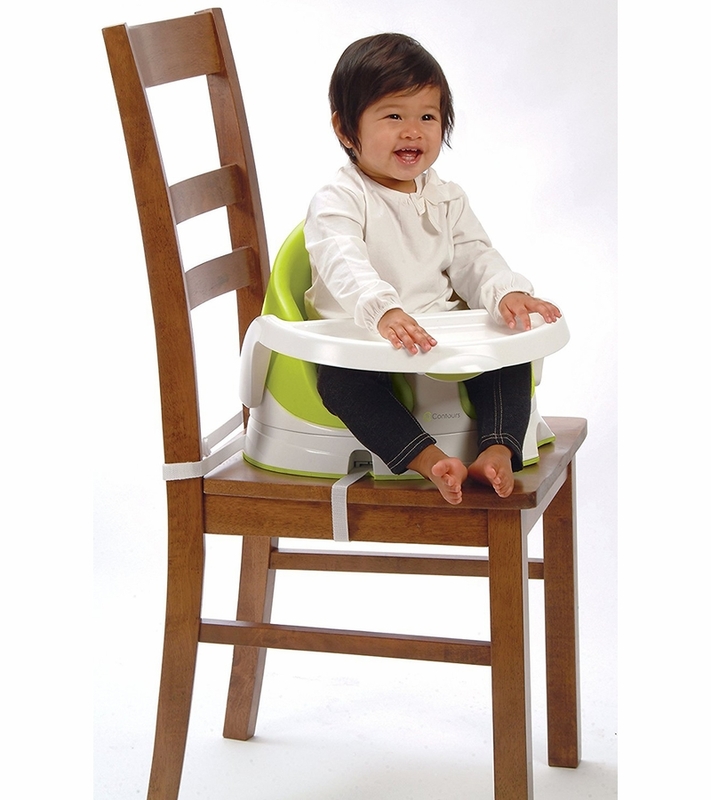 Supportive soft seat, straps to chair for safety and can be used as a high chair, sits firmly on floor for playing. I used it for my 8 month old. I sit him on the floor in the living room with his tray with snack while I clean. I love that the foam part comes out for easy cleanup. I received my contours twist to review a couple of weeks ago and I love how compact it is! I would have given it five stars but for me the tray accessibility is hard to put on and remove. Also the tray part is a wee bit to little. I love that the assembly is easy and fast. The fact that it has a storage compartment for the buckles when not in use on a chair is great. I used it on the living room floor for my one year daughter while watching tv. It's great for bringing over to a friends or family members house when visiting. Does not take up space. The best part is the swivel/twist feature. At first noticed its weight but then realized it said a lot of the quality of the material. Very comfortable. Versatile perfect for growing baby. Perfect space saver for my twins! I was lucky enough to win one of these seats and bought a second one since I have twins. I love that this serves its purpose as a high chair now, but will easily convert to a booster seat down the road! It cleans up easily and saves space in my smaller kitchen/dining area. I love the Berry color as well! The seat comes with safety straps that securely fasten the seat to the chair as well. Once my second child started eating solids I began to realize just how much of an adventure it is to just keep my kids fed. Prepare food, clean up, wash dishes, put away dishes, then repeat many times per day. It's a lot messier than I would often like it to be so I appreciate any products that help make mealtimes more enjoyable for everyone. What I loved about this seat: When the seat arrived it was already fully assembled (plus!). It wasn't bulky and was light enough to move around with one hand, although the plastic felt very sturdy. The foam insert is nice and soft and easy to wipe down. I especially liked the high back on the chair which gave my 14 month old lots of support. Without the high back she would likely try and arch her back to try and throw herself out of the chair. The high back keeps her comfortable and secure. It also keeps little babies from wobbling too much. Structurally it is a very sturdy seat and has no chance of tipping over while your child is in it, unlike some other floor seats I've seen. To twist the seat you simply pull the lever on the back of the seat and twist it until it locks into the next position. There's a loud "clicking" sound as the seat locks into the next position. I liked how that part was so simple. The swivel feature is handy because once your child is in the seat it's not very safe, or practical, to try and lift it up while they're in it. So the ability to twist the seat is a great feature for on the floor and up at the table. 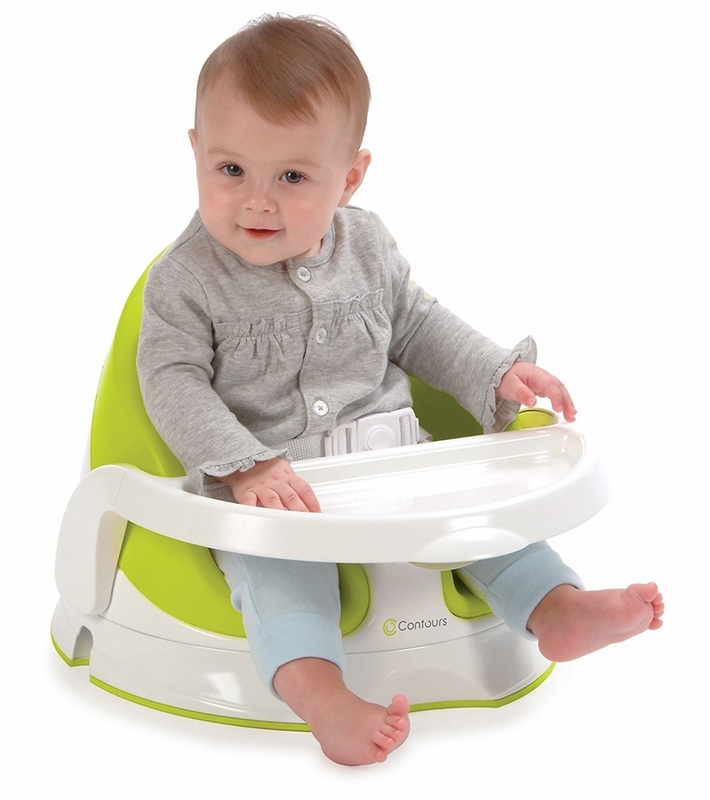 As a booster seat, the Contours Twist is great. Once my child outgrows the foam insert it can be removed so they can use the seat for longer. The seat is very easy to clean, which is of course a must with messy children! I especially appreciated the 3-point restraint. When my child is sitting up in a chair I want to know that they are secure. One thing that was difficult for me was taking the tray on and off. It is secure once it is on and it also makes a loud "clicking" sound so that you know it's locked into place, but I wished it could be done with only one hand. After squeezing the lever at the front of the tray you need to use both hands to take the tray off. So overall I am very happy with this seat! It looks great and keeps my daughter safe and comfortable while she's at the table. Fantastic Product! I will be buying another! I am extremely pleased with the Contours Twist Grow-with-Me seat. Even my toddler was excited for it, right out of the box. For the first couple of days we had it, all he wanted to do was sit in it! Whenever it is on the floor he still goes over and sits in it, then tries to buckle himself and put the tray on! Some of my favorite things about this seat: Safety Straps - with a 3-point harness to keep the child secure in the seat and the straps that secure the seat to a chair when using as a booster, I feel confident that my child is safe. Seat Material - The entire seat is super easy to clean and with the messy nature of children, this is a must! Removable Seat - Because the colored part of the seat is removable, it allows for the seat to be used longer, as kids get bigger, without being too big when they are younger. Rotating Seat - The seat rotates smoothly and clicks into place so it doesn't rotate when you don't want it to. The base of the seat (what would be touching the floor or strapped to the chair) stays firmly in place while the rest of the seat rotates. I found this particularly useful at the dinner table. I could have my toddler facing the table to eat, and then rotate the seat to face me so I could clean him up before getting him out. High Back - The seat has a higher back than most chairs, which gives added support to little ones who are still a bit wobbly. Activity Tray - We don't use the tray when using the seat at the table, but you definitely could. We are able to just push the chair close to the table with the toddler in it and he eats from the table, just like mom and dad! He does like to sit on the floor in the chair and use the tray with his toys. I use the tray with my infant as a floor seat because it helps him hold himself up as he is still a little wobbly. Versatile - It can be used as a floor seat or a booster at the table, which means it replaces two products you might already have. The seat is also recommended for kids 4 months old up to 4 years old, so you will get many years of use out of the seat. I have a 5-month-old and a 20-month-old and I can use it for both of them! Compact - Having this seat makes me regret ever buying a full-size high chair. The seat goes unnoticed if we just leave it attached to a chair and we could stash it in a closet, or really anywhere, if we ever needed to. As a floor seat, it is strictly better than the Bumbo. It is sturdy, doesn't feel like it is going to tip over at any moment, the seat rotates, it has a higher back, the activity tray is firmly attached, and chunky thighs don't get stuck! As a booster seat, it is hands-down, better than a full-size high chair. It is so much less bulky and my toddler actually likes to sit in it! I will be purchasing a second seat since I have two children, only 15 months apart, and they will be able to use this seat for years to come. I can finally get rid of the massive full-size high chair and get some of my kitchen space back! Perfect Seat for my twin boys!!! The Twist was given to my family to review and we love it;)!!! Our boys are 6 months old and one of them is ready to sit in a chair now---the other one still does not have the head control needed to sit. Before receiving the Twist I bought a Chicco PolyMagic high chair that was simply not working for him. Our son suffers from sensory processing disorder and it is really a challenge to find things that suit his needs. Our Easter Seals OT therapist saw the Twist seat and thought that it might be just what we needed for feeding time and she was absolutely right!!! When we were using the Chicco high chair we had a rule that two people had to help put our son in because he fought us so hard and we were afraid he would fall and hurt himself. Since using the Twist seat during meals things have gotten 100% better! The seat is on the floor and is super stable, it is easy to assemble and easy to clean! My husband and I have already decided to buy a second Twist for our other son;)!! We now look forward to feeding time thanks to the Twist!!! Awesome work Contours!!! Love our grow with me seat! This chair is so sleek and looks so much better than all other chairs. Our son is 17 months and fits perfectly. My only complaint and warning is to be careful when you are attaching the buckle under the seat. I pulled too hard to tighten it and ended up breaking the buckle. Really can grow with your baby, easy to clean! I received this chair as a sample, but would still have purchased it. Super easy to clean, easy to install on chairs or just set on floor. The flat bottom makes it very sturdy and secure to set on the floor. Positions baby well and has wider leg openings which is better for baby development. The removable insert also makes plenty of room for baby to grow. 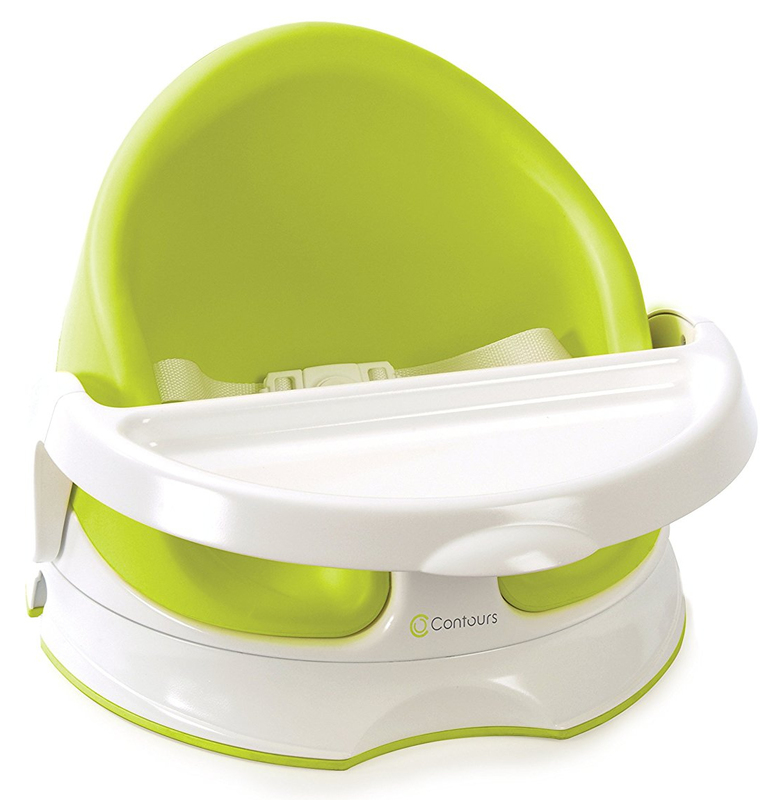 The 180 swivel is convenient also to clean up baby or feed without having to pull chairs out. The tray is a little small and can be difficult to remove, but being small also makes it easier to fit and clean in the sink. Overall great chair! I was given the opportunity to test this product and I would have easily paid for it, its amazing! As a mother of two and military spouse with a deployed husband I am constantly trying to find products that my kids love, that are safe and that help to make my job a little easier, this product hits every one! I got it out of the box and my toddler instantly wanted to sit in it! We were using the graco duo diner for dinner time (it also converts to a booster seat) and my daughter hated it! its so bulky and hardly fits on my dining chairs, the contours twist instantly replaced it! its so light and easy, small enough so my toddler feels like a big kid! Wipes clean hassle free (my graco seat has to be machine washed) My child enjoys sitting at the table and dinner time is now enjoyable for everyone! My infant child who isn't old enough just yet for this seat will have one! I will be purchasing a second one, I look forward to sitting her up for play time so big sister can interact too! it will also be perfect for those first meals where baby food gets everywhere, the fact that it wipes clean with a warm rag sells it! no more smelly fabrics that can't be wiped clean! My first child I used the bumbo and this triumphs over it any day! This item will replace every high chair in my house! I also love that you can remove the foam backing (the aqua part) to make it more comfortable for bigger kids, the tray comes off and can be put back on very easily no struggle at all! The spin method is great also very easy and convenient. Overall I love this product, It was made for moms and I will be gifting and referring this to friends and family of mine! great product and mom approved!